To determine which part to order, measure the exact diameter of your rudder stock (.000") and the inside diameter of the rudder tube into which it will be mounted. Be sure that the ID of the tube is round, so that the barrel of the Type C will slide in easily (without force). If necessary, Tides will machine the barrel of the Type C to ensure a proper fit within the tube. Using the rudder stock size and tube ID measurement, locate your part in the table on the Imperial or Metric Size pages. 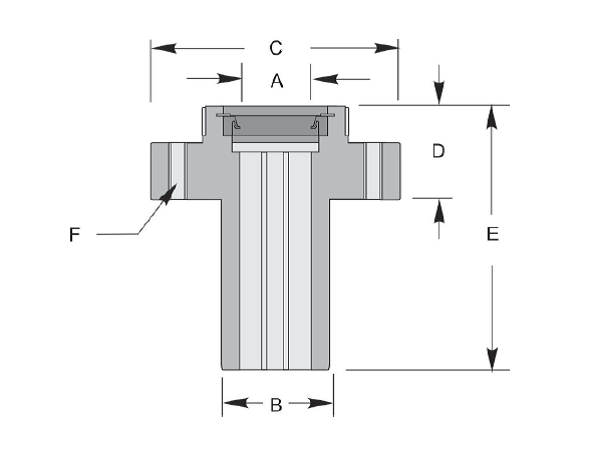 Next, confirm that the existing tube flange is of sufficient size to accept the bolt pattern and diameter of the flange (Column C) on the Imperial or Metric size pages. Make certain your existing rudder tube is long enough to encase the entire Type C within its shape. Finally, refer to Column E in the table on the Imperial or Metric size page to make sure there is sufficient space over the top of the existing rudder tube to install this Type C bearing.